Under that cowboy hat is Gary Brown, a familiar face around the Sydney Country Music scene. 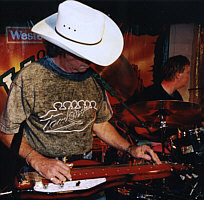 Gary is pictured with a Tomkins Silky Oak Special lap steel, which he plays in addition to the dobro. Go back to the PICKERS page to see who else plays a Tomkins.